Finally an Armorer's Wrench with everything that you need. This unique tool combines all of the necessary tools to eliminate the need of owning multiple wrench types. Use it for all of your assembly and all of their variants. The wrench allows the installation/removal of barrel nuts, muzzle devices and buttstocks. Made of powder-coated steel, the wrench's long-lasting durability can be counted on. What makes this mat so smart? It was built by AR owners for AR owners. It’s large enough to handle a field-stripped AR15 with the visible instructions to get you there. The attached parts tray ensures your pins, bolts and springs are never lost again. Its oil-resistant surface allows you to properly clean your gun without ruining the kitchen table. 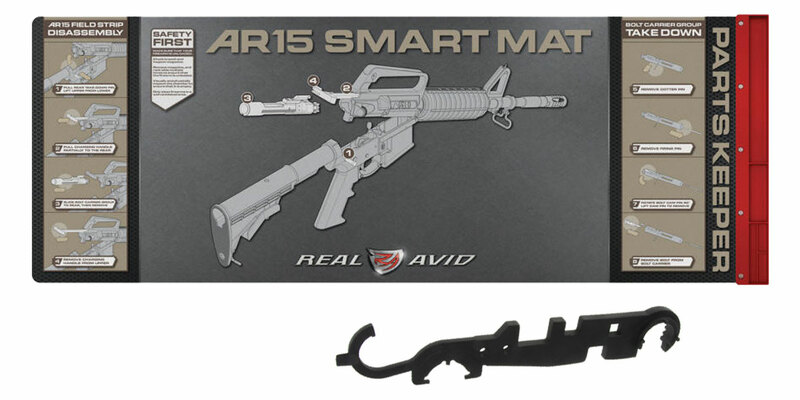 The AR-15 Smart Mat is everything your greasy towels are not.